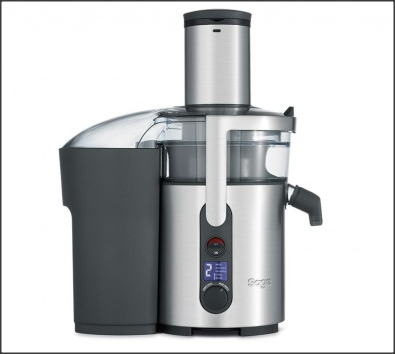 I have just purchased the Sage Juicer Plus from Amazon, in an effort to get my 5+ a day, now for those of you that know me fruit is not really my thing, only because my range of appetites is Apple, Orange and Banana. So having tried this last night I thought I would do a mini review as I spent over 2 weeks researching whether to get this or the Philips HR1781 from JuiceMaster.com. We had brought a Smoothie but unfortunately this got refunded due to being out of stock, which was a real shame for crushing up the ice – I did not want to put into this machine just in case. Sage offer a great warranty on the machine 2 years + 3 additional for the motor, so this will last for long time and remember you may, like me think this is expensive but in comparison getting in effect lots of apples, ginger, celery, oranges (and the list can go on) all in a nice, refreshing simple drink cannot be beaten – it is your health after all….! Although fairly expensive it is a great machine with a nice LED (geek in me!) read out, the parts are easy to change and thus very easy to clean, the variable speed limits are designed for different types of fruit and I agree the various You Tube videos from Heston Blumenthal are spot on I am really pleased with this. Out of the 3 books we have purchased short list to 10 juices first and test these. Get my test buds used to them. Look at a 3-5 day detox. Combine this with the 5:2 Diet. Add smoothies into the mix. Welcome back for those of you who know Office 365 (Microsoft’s Cloud offering for Exchange, SharePoint, Lync and Office Web Apps) or even Office 2013, I had an issue with a trial version of Office and needed to extend it for a short while so with thanks to HowToGeek I have the below procedures. Office 2013 is a great product and one of the best Office products Microsoft have developed, it follows the standard ribbon bar that was introduced into Office 2007 but evolves the Office 2010 productivity and tab menu system. My best feature is within Outlook 2013 with the quick function – you must check that out. So depending on your Office 365 plan you may have the Office 2013 subscription as part of your Enterprise plan (Ex). Below will help you extend for a short period of timing giving you that break to renew your subscription or buy Office 2013. Hold down the Shift key, right click the folder called OfficeSoftwareProtectionPlatform and select the ‘Open command window here’ option. Press Enter, and you’re done. You can also navigate direct to C:\Program Files\Common Files\Microsoft Shared\OfficeSoftwareProtectionPlatform or C:\Program Files (x86)\Common Files\Microsoft Shared\OfficeSoftwareProtectionPlatform and type OSPPREARM.EXE into Explorer’s address bar before hitting Enter. Your Subscription has expired and therefore (depending on plan) will cause Office Pro Plus 2013 to expire. If you would like any help with Office 2013 or 365 then please feel free to contact us at http://www.outboundcomputing.co.uk – we are a fully qualified Microsoft Office Cloud Partner and would be more than happy to advise.